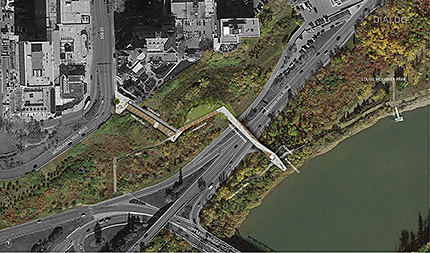 The Mechanized River Valley Access project makes the river valley more accessible to people of all ages and abilities. 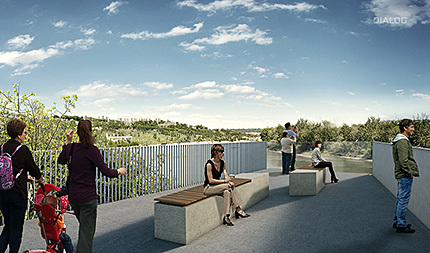 On June 23, 2015, City Council approved the construction of the project connecting 100 Street near the Hotel Macdonald to the river valley trail system near the Low Level Bridge. Construction began in March 2016 and the facility opened in December 2017. While the funicular may be the most attention grabbing and unique part of the Mechanized River Valley Access, the project is about so much more! Mechanized access creates a new destination in our city: an innovative, barrier-free system that allows people to enjoy both our vibrant downtown and our amazing river valley within minutes. And while connectivity to nature is a key element, the project has also been designed to include programmable spaces, as well as places for active play, social engagement and relaxation. The project cost $24 million and was funded by the River Valley Alliance supported by the provincial and federal governments and the City of Edmonton. View the River Valley Alliance photo gallery. The promontory allows users to take advantage of the amazing views from the top of the bank near the Hotel Macdonald. Stop under the sheltered canopy as you load onto the funicular, take a moment to relax at one of the seating areas or spend a few moments at the top of the urban staircase and take in the sights. These wide and welcoming stairs are a place to linger, to stop and sit or to get in your daily workout. For those cyclists not wanting to take the funicular, a bike rail runs the length of the stairs. With plenty of space for wheelchairs, walkers, strollers, and bikes, the glass-enclosed funicular carries users from the top of the bank to a promenade above the valley floor. The funicular fits up to 20 people and can accommodate different configurations of bikes, trailers, strollers and specialized equipment like wheelchairs or mobility scooters. The funicular is free to ride and is open during standard park hours. The steps and the funicular land on a promenade, which includes a grassy seating area with benches for people to stop and enjoy the views. The promenade is designed to accommodate both through-traffic and citizens wanting to eat lunch, watch the sunset or take in the Canada Day fireworks! Connecting the promenade to the lookout, the bridge provides safe passage across Grierson Hill Road. The bridge gently slopes down to overlook the edge of the river. A glass railing and built-in seating allows a seamless way to take in the flow of the river and the downtown skyline! 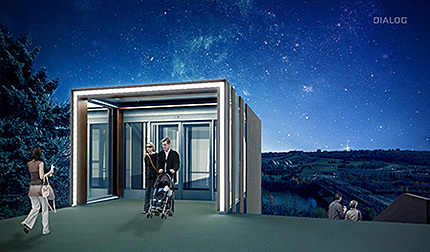 The elevator is an essential part of creating accessible, barrier-free access to the river valley. From the bridge, an elevator and a staircase connect to the existing trail system and Louise McKinney Park, the Low Level Bridge and the Rossdale/River Crossing area. This project qualified for the City’s Percent for Art Program. The artwork, Turbulent, by Jill Anholt, is inspired by the unique water patterns of the North Saskatchewan River. Turbulent will consist of thin, brightly-coloured metal ribbons that will float above concrete benches on the grass lawn north of the promenade. 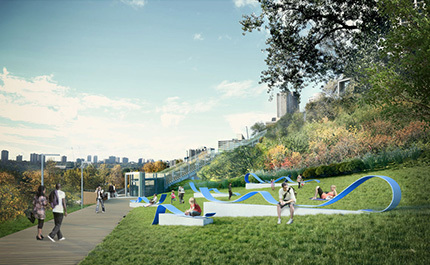 In addition to being a vibrant art piece, the ribbons will act as seating for pedestrians to pause, sit, lounge and converse while taking in incredible river valley views. Why was a funicular chosen? The funicular was selected as the best option for this location. Funiculars are safe, have a smaller footprint than other options, typically have long service lives and are more economical than other fully accessible systems. 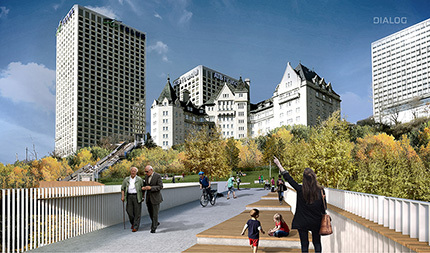 The Mechanized River Valley project will connect 100 Street near the Hotel Macdonald and the river valley trail system near the Low Level Bridge. Construction began in March 2016 and was completed in December 2017. Partners share common goal: protect, preserve and enhance Capital Region’s river valley park system.